Photo: Courtesy of Sanctuary Spa. How far would you go to have the cheekbones of Kate Moss? (Not the actual ones, Hannibal —we're talking figuratively.) Not long ago, I found myself wondering exactly this, as a woman pushed her index finger along my bottom gums. While entertaining neurotic visions of my teeth popping out of my mouth, I began wondering whether I'd finally gone too far in my quest for good skin. The best part? I signed up for this. See, I'd been offered the chance to partake in one of facialist Nichola Joss's legendary treatments. Joss is well-known at London's Sanctuary Spa, where she tends to the skin of professionally beautiful women such as Gwyneth, Gisele, Scarlett, and, yes, Kate. (You know their last names.) Since the age of 19, Joss has been developing her signature facial, which involves lymphatic drainage and plenty of massage. I don't mean the relaxing, foo-foo kind of massage, either — when Joss goes to work, she does not go gently into that good face. Not that Joss herself isn't serene. She has a warm, caring presence; even before she started working on my face, I liked her vibe. (She was understanding and empathic about a chin breakout, a welcome reprieve from the many aestheticians who make you feel as horrible as a kitten-killer simply because your chin has a few bumps.) After cleansing my skin and sneaking in a few quick extractions, she began to give me a massage unlike I'd ever experienced. I'd read about facial massage before, and I thought I'd experienced it, too. Nope. As Joss applied a warming exfoliating mask, she kneaded my skin firmly. This wasn't light, relaxing pressure; it was invigorating. Energizing, even. This is pretty great, I thought. Then came the real massage. Joss applied a few drops of Sanctuary Spa Therapist's Secret Facial Oil, which she helped develop. The blend of 99% organic oils (including sunflower, jojoba, rosehip seed, and wheat-germ oils) promises to make skin look softer, plumper, and younger. All I knew was that it smelled heavenly, and I prepared to bliss out to a relaxing rub. How naive I was! Next, Joss slapped on some latex gloves. "I'm going to massage the inside of your mouth now," she explained. I lay frozen, worried that some phantom chunk of kale would be unearthed during the process, I would die of humiliation, and then poor Joss would have to explain what happened. The show went on, despite my kale paranoia. Using her index finger, she moved along my upper and lower gums, applying upward pressure. It hurt, and I wondered if one of my teeth might wiggle loose. While I silently freaked out, Joss proved that she could "read" my lifestyle just by feeling my face. "You're holding a lot of tension in your muscles, especially around your jaw," she said. (Me? Tense and wound tight? Never!) Joking aside, she was right — I'd been waking up with a sore jaw for months, and although the sensation of a mouth massage was uncomfortable, it was also a relief to feel that tension rubbed away. While I still wouldn't call the process "relaxing," I did feel invigorated when it was over. And, after Joss gently pressed the oil into my face, it was time to see the results. I looked in a mirror, and I was amazed. My cheeks looked more defined, somehow higher and rounder — yet at the same time, my face looked plumper and fuller. Healthier. All of that pressing and pushing had increased circulation, but it had also given my facial muscles a literal workout. Joss advised me to continue massaging at home with the facial oil (a bottle of which includes directions on mimicking Joss's technique). "You're going to see results immediately with the oil," she explained, "because instantly it's going to make your skin radiant and plump and glowing. Over a couple of weeks, you're going to start to see an improvement in the tone and the texture of your skin." After about six to eight weeks, she said, I'd see improvement in fine lines and wrinkles. It hasn't been that long yet, but already, I have noticed an overall boost in my skin's appearance and texture. A dry patch returned to normal in a few days, and within 10 days of doing the oil-massage thing, my skin just seemed calmer and happier. A long-standing cyst began to recede, and because a lot of redness is fading, I've been getting faint glimpses of that elusive glowing-without-makeup thing. It's unlikely that someone will mistake me for Miss Moss anytime soon, but it's all about baby steps. Even if it takes a finger in the mouth to get there. 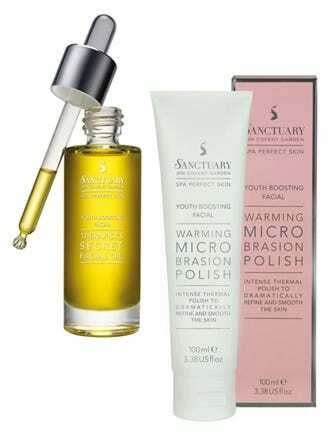 Sanctuary Spa Therapist's Secret Facial Oil, $40; and Warming Microabrasion Polish, $25, available at QVC.